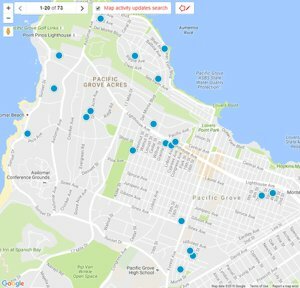 Search all of Pacific Grove’s Forest Hill Area real estate listings of homes, condos for sale plus foreclosures, short sales and Pacific Grove’s Forest Hill information on one easy webpage. Real Estate in the Forest Hill area of Pacific Grove is less eclectic than most of Pacific Grove. It is rare to see an old Victorian Era cottage in this neighborhood. It is however full of 1950’s, 60’s and 70’s homes ranging from little 2/1 cottages to larger ranch style homes. In general, the homes up here are more affordable than the homes down closer to the water or even those in Central Pacific Grove. The vacation home crowd tends to shy away from real estate in this area as the lifestyle offered here is different than that of the downtown area or the waterfront neighborhoods. Being up the hill away from the older downtown part of Pacific Grove, the Forest Hill neighborhood is less convenient for walkers that want access to the beach or downtown shops and activities. This area tends to be occupied by more full time residents than second home owners. It is important to note there are some ocean views and views of Monterey Bay from the top of the hill in the Forest Hill neighborhood, which can affect real estate values dramatically. The Forest Hill neighborhood is another nice area in Pacific Grove located at the top of Forest Avenue near the stores and shops in the “newer” part of the city. The one and only national chain restaurant (McDonalds) is located in this part of town along with two larger grocery stores. Residents can find various other shopping necessities in this area along with several great restaurants. This area caters more to the full time residents and less to the tourists and has a more urban feel to it. The upper section of Forest Avenue is lined on either side by commercial buildings including a couple of small strip malls. The Forest Hill neighborhood is sandwiched between New Monterey to the east, the Presidio of Monterey to the south, Pacific Grove’s Del Monte Park neighborhood to the west and the Country Club Gate neighborhood north. If you are looking for a great affordable neighborhood in Pacific Grove to call home and you really do not want to be near downtown where all of the tourist activity is, the Forest Hill neighborhood might be right for you. The latest listings of Pacific Grove homes for sale in the Forest Hill neighborhood are located on this page. For a full list of everything that is available in this sought after neighborhood, you can build an advanced search or contact one of us and we can do it for you. If no homes are showing at the bottom of the page that means there are currently no homes available in this neighborhood. Our website has detailed information including Forest Hill real estate statistics if you are interested in learning more about real estate values in this Pacific Grove, CA neighborhood. If you are interested in seeing homes for sale in the Forest Hill area, contact us.